Under a New York Times Magazine collection of essays titled “First Words”, Emily Bazelon explores something most people in the United States would consider a simple right: the act of using a public restroom. In contrast to the aforementioned statement, reality reveals access to public restrooms is not as welcoming to a progressive population of individuals who identify as transgender. This struggle has since driven a call of action for “accommodations” to be made in favor of the implementation of gender neutral restrooms. The first instance of legislation discussed in the article was a proposed ordinance for the city of Houston, Texas. It would have defended individuals against discrimination in public spaces, which included restrooms. Groups in opposition of the ordinance created a grim campaign video (also inserted below) that focused on violence in bathrooms to sway voters not to pass the law. School districts are also handling transgender rights, on a case by case basis. After defining the origin of “accommodate”, Bazelon provided examples of historical accommodations in the United States. Citizens have been granted permission to observe religious practices in the workplace, and more recently, the Americans With Disabilities Act broadened access to public spaces that were previously unavailable to the physically challenged. The separation of restrooms occurred much earlier as a way to accommodate women who left their homes during the day to work or enter places “previously dominated” by men. Over time, women have collectively designated the women’s restroom to be an estrogen-dominant territory. One of nearly two dozen gender neutral restrooms on the University of California-Irvine campus. Today, activists are fighting for gender inclusive (or “all-gender”) single-stalled restrooms for transgender people to have a form of privacy. Bazelon continues to describe the account of a preadolescent transgender girl who simply wants to fit in with her peers. The school allows her to use the same locker room as the rest of the girls. The author later compared accommodations for disabled people to the start of making accommodations for transgender people. 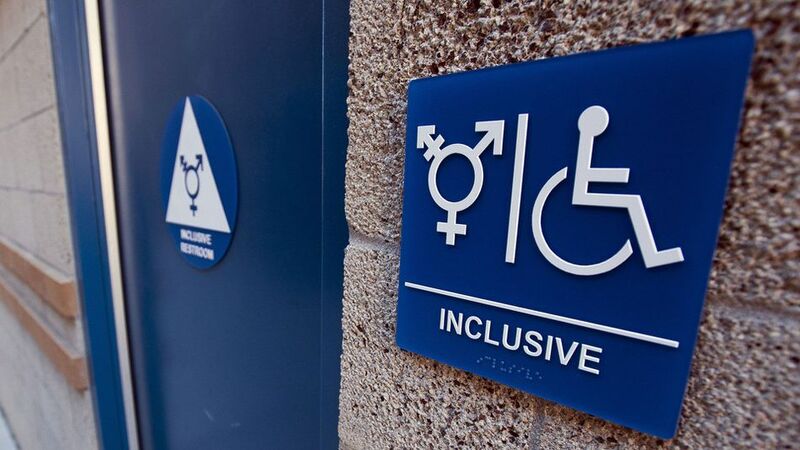 Bazelon claims making changes in spaces, such as public restrooms and locker rooms, are all “about relatively small adjustments for the sake of coexistence.” In the last paragraph, she references a resource guide, developed by the Transgender Law Center, that provides information on how someone can protect themselves from a bathroom access issue. Bazelon also inserted quotes from the text which where examples of what could be done if someone was encountered in the restroom. She then ends the article, focusing on a specific word from the resource guide: “belong.” The human desire to fit in and belong is not inessential; it’s vital.